The next SEARS launch is October 4th in Samson, AL. The event is Odd Rockets. Any Halloween themed rocket is welcome. See pictures below. Why not take advantage on the plethora of Halloween items in the stores. Of course keep it safe and stable! The weather was better than we thought. We had no showers. A great hot day for launching rockets. 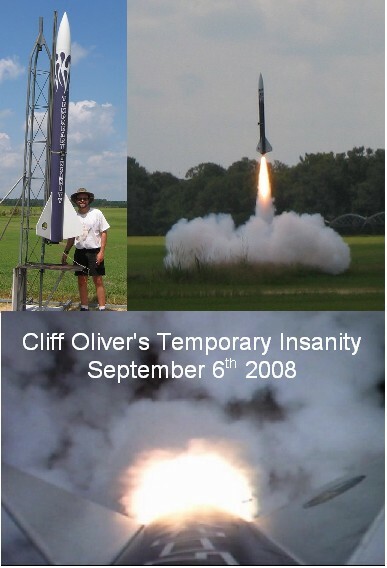 Cliff Oliver had the launch of the day with his Temporary Insanity. Cliff’s family came out to witness a perfect flight on the AMW M1350 White Wolf. The boost was very straight and the rocket landed nicely in the field. The rocket had an on-board video camera that gave us some of the best video yet. We had Russ Roberts with a sucessful L1 Cert with his PML Explorer. Justyn Palmer had a successful L2 with his scratch build “Shoot the Moon” Rocket and finally Ricky Nichols launched his Giant Leap Vertical Assault painted red of course for his L2 also. Congratulations to all. Alexa Stetson won the Scale event with a flight of her Patriot. Thanks to Russ Roberts for bringing many interesting scale rockets. See pictures and videos on the web site. Thanks for a great day. The next launch is October 4th. The event will be Odd Rocket Day. What kind of Halloween creations can you fly? You are currently browsing the SouthEast Alabama Rocketry Society weblog archives for September, 2008.